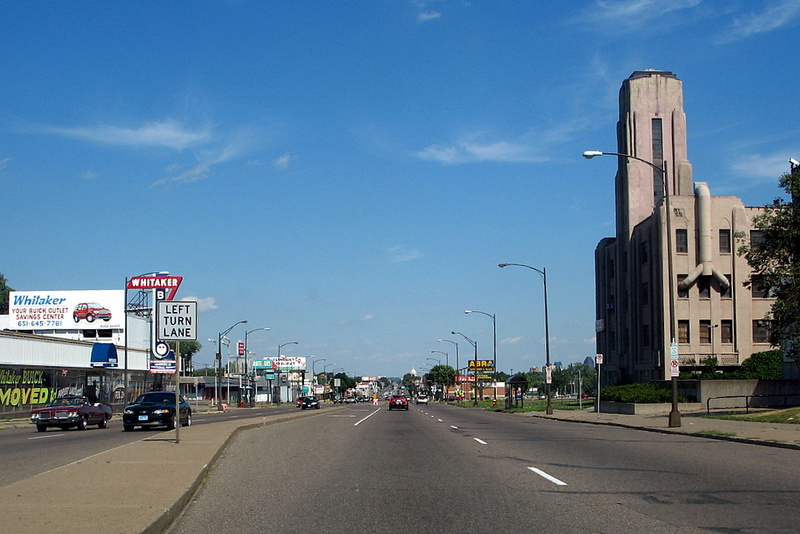 The view is to the east, traveling on University Avenue in St Paul. I cannot give you a cross street reference, but I am about one mile west from the State Capital building. If you look closely it there, way down the road you can just make out the dome of the building. I love the look of the building on the right. Is that an old school? I can see it. Maybe it could be enhanced with gold to shine more. The dome of the Capital building in West Virginia is covered with gold so it stands out like another sun. Golden dome on the Capital building, that certainly would stand out more. That building on the right reminds me of the old Montgomery Wards building that was not too far from this location, but on a smaller scale. That's University Ave W between Syndicate and Griggs streets. I used to know what the old Moderne building was - can't recall anymore. It's been years since I was in my old neighborhood - living in Vermont now.